Game used bats, no matter the player or year they were used, are all unique in that they were part of a Major League game. 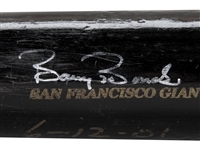 Yet, even within the rarified category of game used bats, there is an even smaller, ultra-exclusive subsection to which this Barry Bonds bat belongs. 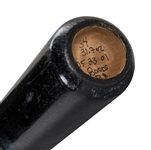 The Giants slugger used this bat during his record-setting 2001 season in which he set the single-season home run record at 73. Bonds would begin a run of four consecutive National League MVP’s in 2001, which was on top of the three previous times won the prestigious award. 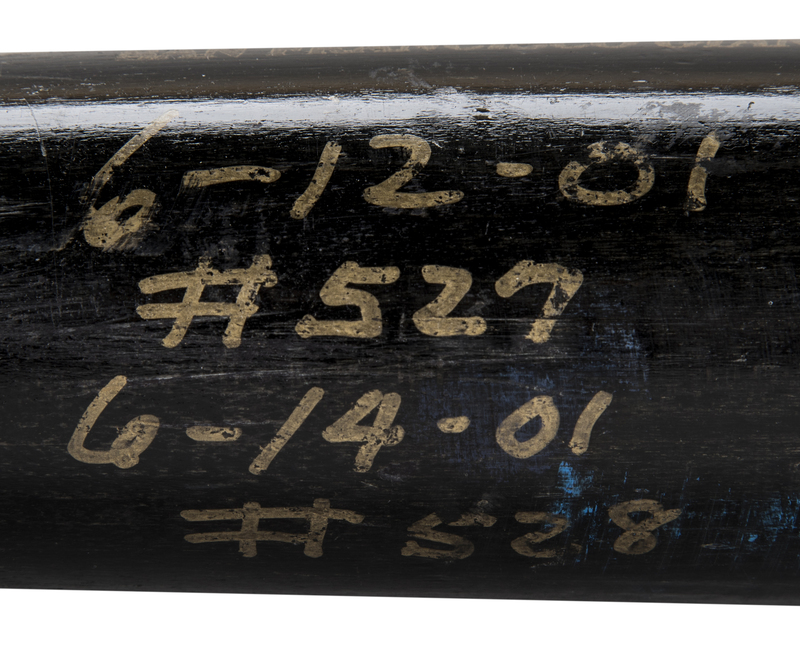 This offered bat was used to hit home runs 33 and 34 of the 2001 season, which were Bonds’ career home runs 527 and 528. 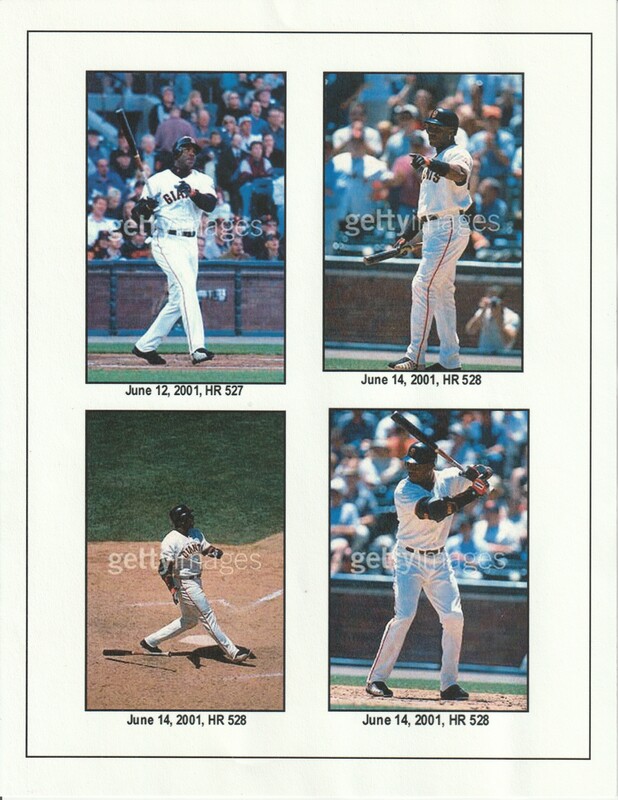 These home runs were hit over two games in June of 2001, both at Pacific Bell Park in San Francisco against the visiting Anaheim Angels. 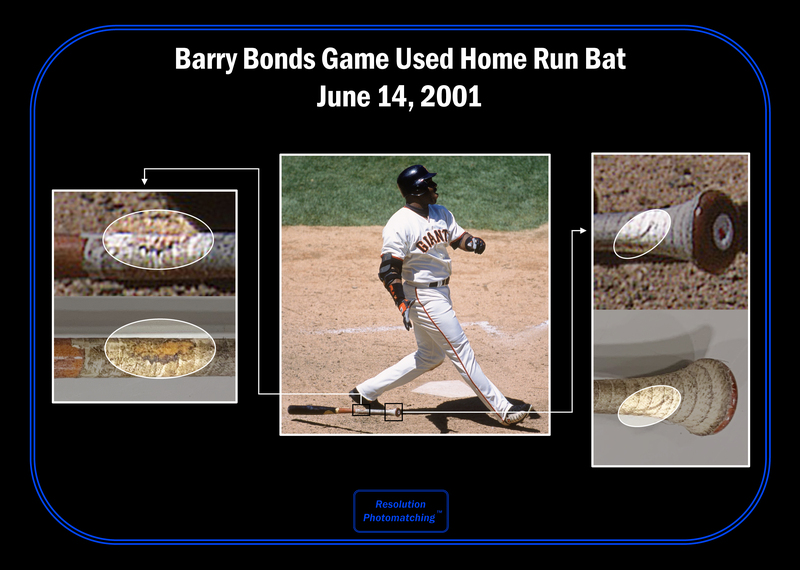 Bonds hit career home run 527 off Angels pitcher Pat Rapp in the bottom of the first inning of the June 12th game and connected on career home run 528 two days later on June 14th in the bottom of the sixth inning off of Lou Pote. This SAM BONDS 2K1 model bat, as would be expected coming from the all-time home run king, displays tremendous game use. There are prominent ball marks and ball stitch impressions on the barrel. This un-cracked bat also displays blue ink transfers and cleat marks on the right and left barrel. The handle has been in a spiral pattern approximately 13 ¼ inches from the knob to enhance the grip and there is a moderate coating of Mota Stick on the taped handle. 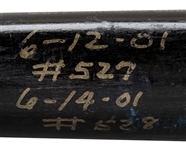 Handwritten on the top barrel in black ink are the bat’s length “34”, weight “31.7oz”, the date of manufacture “05 23 01” and model number “Bonds”, along with Bonds’ initials “B.B.”. 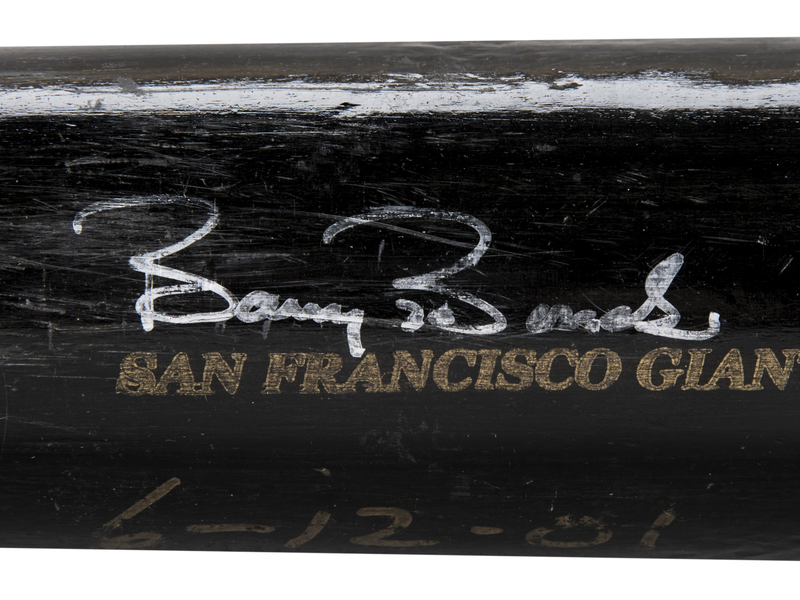 Bonds has signed his name in silver marker on the barrel directly above the gold stamped “SAN FRANCISCO GIANTS”. Also handwritten in gold marker is “6-12-01 #527” and “6-14-01 #528”. 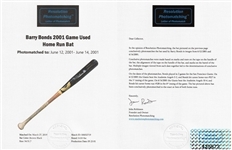 A tremendous opportunity to own a multi-home run game used bat from Bonds’ historic 2001 season. This bat has been photo matched to career home runs 527 and 528 by Resolution Photomatching, who have provided a LOA. There is also a LOA from PSA/DNA (G55984), who have graded this home run gamer a perfect GU 10 (Grade Certification # 81976314). 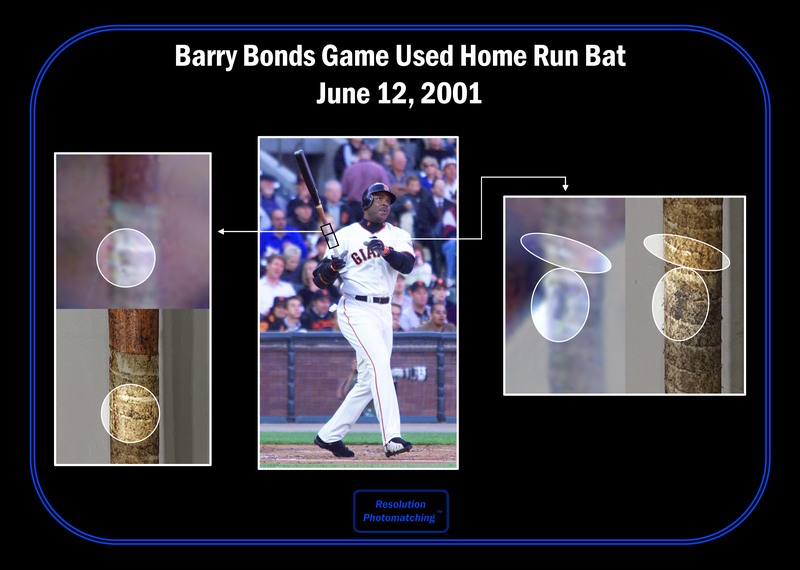 Additionally, there is a LOA from JSA for Bonds’ signature and Barry Bonds Authenticated hologram on the barrel.